"Our sincerest and deepest sympathy to you, Frank, for your..."
"Beth, you will be missed by your friends in the Tri-Cities..."
"I'm sorry for your loss. May God comfort you. (1 Peter..."
"We have known Beth and Frank since the Black Cat Motorcycle..."
Beth was born Oct. 24, 1939 to Cecil A. Cloud and Elsie L. (Luke) Cloud in Kila, MT. She passed away May 9, 2015 at her home in Kennewick, WA with her family by her side. Her ashes will be taken back to Kila, MT. Beth married Frank Burns on Nov. 17, 1956. She had many interests and talents and thoroughly enjoyed life. 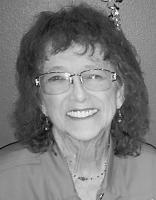 She loved to do any craft that came along: crochet, embroidery, tatting, Swedish weave, and most recently quilting. She also played the piano and various other instruments and entertained family and friends throughout the years. Beth was never afraid to try something new, and enjoyed participating as Scout Den Mother, and President of her TOPS Club, Ostomy Association, and Home Extension. She was a member of Vancouver Black Cats Motorcycle Club, Eagles Auxiliary, and Moose. She was also interested in genealogy. For a number of years she and Frank lived full time in their motor home, traveling around the United States, seeing the sights and making many new friends along the way. She had a vast collection of elephants that was acquired as they visited the different areas. Family was very important to Beth, and she was always there to lend a helping hand, sometimes with the planning of a family gathering or when there was an emergency or illness. and to hear her latest stories. Beth is survived by her husband, Frank; sons, Rick (Kelly) Burns of Vancouver, WA and Jeff (Karen) Burns of Pasco, WA; five grandchildren; five great-grandchildren; sisters, Shirley Miller, Rose White, Della Frasier, Karen Rel, and Pearl Shelton; and brothers, Ed and Rick Cloud. She was preceded in death by her parents; sisters, Dorothy Peterson and Jenna Mae Harsoch; and brother, Jim Cloud. There will be no service per her request.